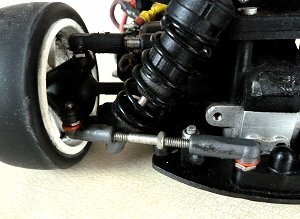 Toe Angle Explained • for RC Beginners. 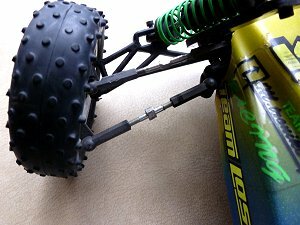 RCScrapyard ► Toe Angle Explained • for Radio Controlled Models. 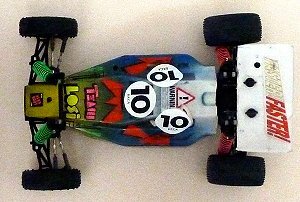 When you first build your RC model car, you will no doubt have made all the settings advised in the manufacturers' manual and will take it out on the back yard not thinking of things like camber, caster or toe-in … I know I did. It's only when you get competitive that you start learning about these things and just what a big difference they can make to the handling of your car. One of the more effective of these adjustments is Toe-in. The term, toe-in, toe-out, or toe-angle, refers to the alignment of the front or rear wheels, when viewed from above. 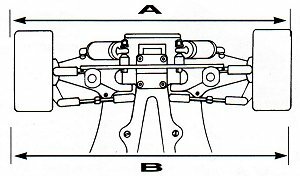 Front toe-angle is easily adjusted via the track rods or turnbuckles that link to the steering mechanism or directly to the steering servo horn. 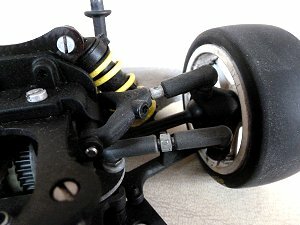 At the rear, some models like the Schumacher Mi1 can be adjusted by turnbuckles, but most models, on and off-road, have a set of hub carriers to provide the desired toe angle. To measure toe-angle, I used to use my trusty vernier callipers to measure the width at the front of the wheels and the rear of the wheels and using this information along with the diameter of the wheels simply calculate the angle. Or, you could alternatively use this data to draw a triangle on a sheet of paper and measure the angle with your old school protractor.